Hi and Welcome to Red Couch Recipes and grab a seat on my Red Couch; its a comfortable place with a view of everything that goes on in the Red Couch Kitchens! Tonight I spotlight pears...the fruit of the end of summer. I love all kinds of pears, but Bartlett are my favorite. I love D'Anjou with chocolate fondue. D'Anjou is on the menu tonight. 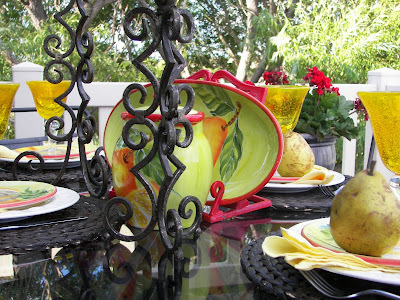 Welcome to Tablescape Thursday and to Alphabe-Thursday where the color of the week is YELLOW! 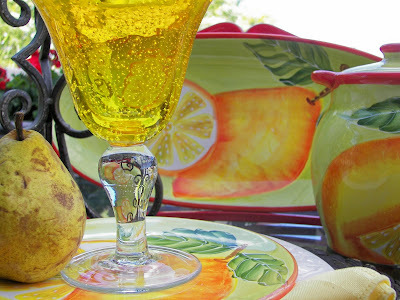 The color of pears and great glasses! The goblets are from Tai Pan Trading, a local store and they are SCREAMIN' YELLOW! 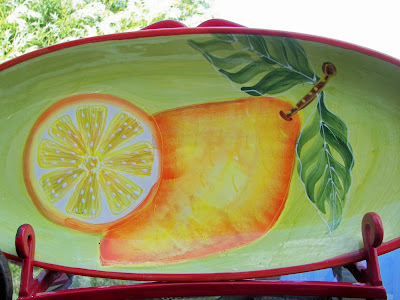 I have used these fun dessert/salad plates on a tablescape on my blog before! They feature lemons and pears! The plates are from Roberts, a local store. The placemats are from Wal-Mart and I have loved them...okay, so maybe I use them too often! Tonight dinner is being served on my deck. We eat here almost every day on the deck in the summer. I have several accessory pieces including this oblong platter. It's a great serving dish. This is a full view of the table. I love bright colors and I love the bright colors on this tablescape! I included this photo because I like the candle holders in the picture. How about you? Thank you for dropping by my Red Couch and sitting for a spell. Also wanted to wish my daughter Tatianna at Polka Dot Pantry Sweets a Happy Birthday! She turned 14 yesterday. Fourteen years ago she was BORN ON THE LAWN! We had fun celebrating her birthay; we shopped, went out to lunch, and then Grandma treated us at See's candy. 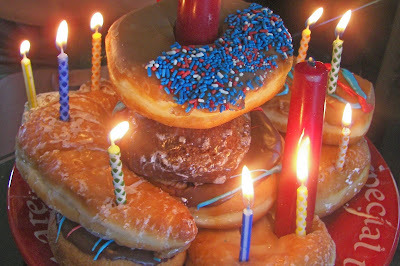 This is picture of Tatianns's "Birthday Donut Tower." We serve this on all our birthdays for breakfast on the "You are Special" plate. Happy Birthday Tati! I am posting this with Susan at Between Naps at the Porch for Tablescape Thursday and at Jenny Matlock's Alphabe-Thursday. Happy birthday to your daughter! I love your goblets and dishes. It is all very pretty. Love all the yellow, especially the stemware. Happy Birthday to your daughter. Oh I love those yellow stems! Happy Birthday to your dd! Where to begin? I've never seen a donut tower, but it is a great idea. I love all the bright colors in your tablescape. The goblets are wonderful and perfect with the dishes. Your daughter was born on the lawn?? That sounds like a story! We can only get See's candy around here at Christmas. You are very lucky! Happy Birthday, Tatianna - what a lovely name! Someday we'll have to find out about that birth on the lawn! Very nice submissions for yellow! Happy birthday Tatianna! Happy Birthday Tatianna! I am loving the yellow! 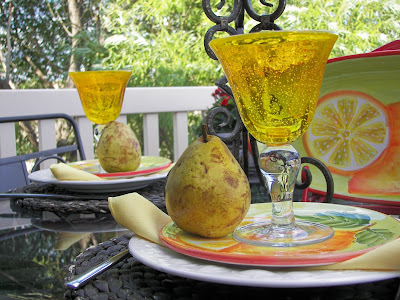 I have those same gold goblets I need to get them out and use them for summer tablescapes. Love the plates and serving platter and the candlesticks! Beautiful job on the whole tablescape. Birth on the lawn? You must have had a fast labor and delivery! That has got to be one crazy story! What a bright and cheerful tablescape to celebrate Tati's birthday! I hope she has been having a great week of celebrations. Very pretty, lovin' your yellow goblets! Happy B-Day to Tati! I'm sure you all had fun! The birthday donuts look wondrful. I love the table. The pears look great! Joni, Those brilliant yellow goblets are so pretty - I just love them! They go very well with your pretty pear and lemon plates. This is a really pretty summer table. I like your birthday donuts breakfast too. Joni, as you know it's the little details that make things special, and you have it down pat! Gorgeous yellow glassware, and table setting..
Those goblets are terrific! Those placemats are great, no wonder you use them a lot. I love the design on those candleholders. Your birthday doughnut tower is such a fun tradition! Joni, We have the "Your are Special" plate and have used it for over 20 years. Can you imagine how precious it is to us? And I'm sure to you also!!!! I love your happy, sunny pear inspired table! Yellow is such a happy color, and you have added a richess and depth to it with your use of some lovely black to ground it. Beautifully done! And happy birthday, Tati! I would love to hear the story of her lawn birth! 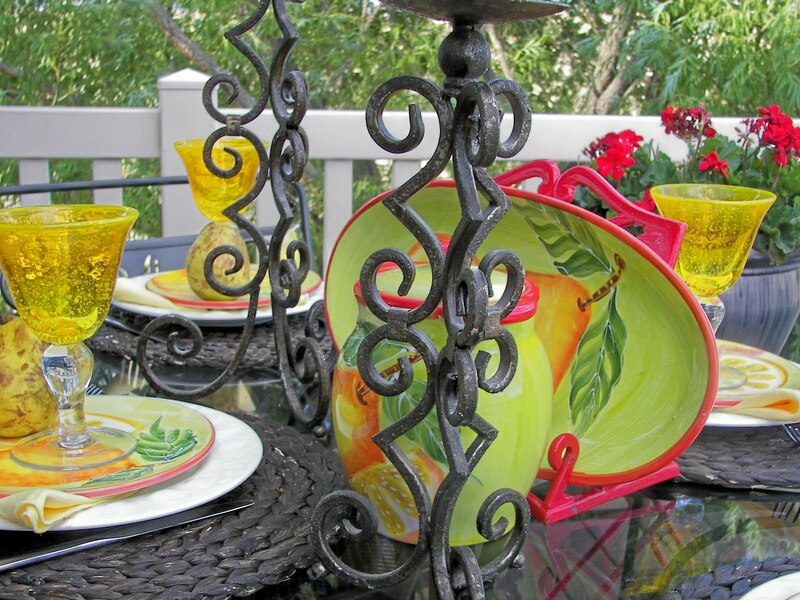 Pretty colors on your tablescape. I love the donut tower. Cute idea. Yummy too! Love the dishes, especially the glasses. Pears are beautiful and simple. And doughnuts....oh yeah! Hi. Thanks for visiting. Looks like you have a fun table! 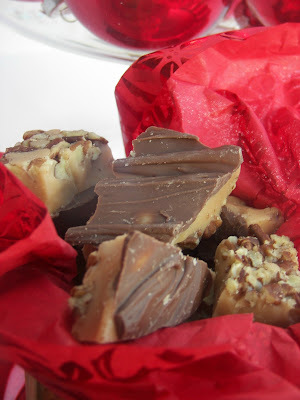 Now I have a blog to visit when I need a good recipe! Thanks. Oh, I love these bright colors! What wonderful yellow glasses -- you just don't SEE glasses that color, and they're marvelous. 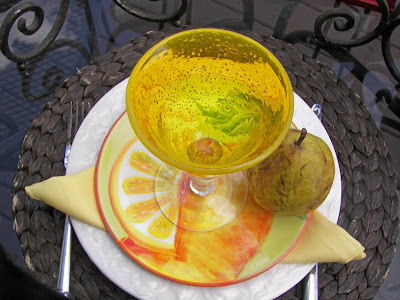 I love the pear theme, and I'm planning a pear-themed table soon. Thanks for some new ideas and for your kind comments on my table this week. You're more than welcome to come join me in the pool! Love your colorful and fun table. Glad we can both follow each other. I'm so jealous you and Jacqueline and your daughter can share and inspire one another. I am also jealous your climate is so mild you can dine outdoors all summer. The heat has been extremely harsh this summer here. I can see your blog is going to inspire me. Great table. Those yellow glasses are just incredible. You need to share Tati's birth - maybe with a cake that is decorated like it is grass! That would be a fun post. 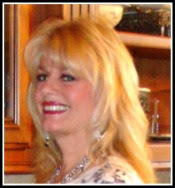 Happy birthday to Tati and I will hop on over to her blog and wish it to her too. those yellow goblets are just to die for! What a lovely stop on my little journey through Alphabe-Thursdays Rainbow Summer School. I would never have paired pears with chocolate (ummm.... weird sentence there) but it sounds like something my husband would love. This is a wonderful tablescape and such a happy post. Happy Birthday to your lovely girl. I'll pop over to her blog and wish her well there, too! Well, I almost didn't make it around before Green. Great Pear tablescape!